The cable fault locator has been designed to trace underfloor heating elements, electrical cables and most wiring that is beneath a floor surface or a wall that has been broken. 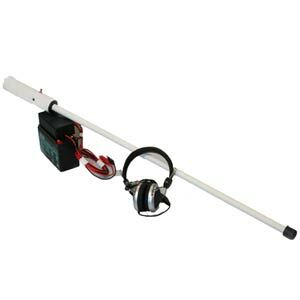 The Cable Fault Tracer comes with a transmitter and receiver and rechargeable 12V battery. This machine is able to trace position of broken cable by connecting the transmitter to a 12V battery thereby sending a signal through the wire. By utilising our Locator machine ( Receiver, 9 volt battery ), you are able to follow the signal along the wire until the signal stops. This is where you would know where the problem is. It is an extremely user friendly machine. Clear audio signal – A peak in the signal accurately locates the live cable so its orientation can be determined. Perfect to detect fault on under floor heating, or to follow wires under the floors. Easy to use – Designed without any unnecessary extras. One control does it all!